The perceived wisdom was that Wexford had too many scoring forwards for Longford to handle. One of Lyng, Brosnan or Barry would step forward for the free scoring Yellowbellies and see them through. 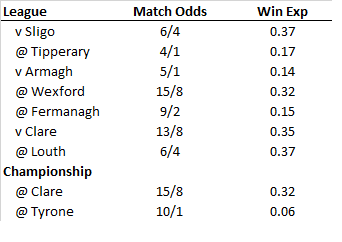 The above table would seem to bear this out with Wexford having more chances and performing better in front of goal. This didn’t come come from the expected sources however. Apart from half-back Adrian Flynn (see player tables below) Wexford’s shooting was bang on average. Take out Flynn’s shooting, & Brosnan’s deadballs, and they would have an Expected Return of -1.14. Longford’s shooting was poor. Like Wexford they had a “big three” up front in Kavanagh, McCormack & Paul Barden. However unlike Wexford one of them stepped up with Kavanagh scoring 4 points from 5 shots with an Expected Return of +1.94. Of course what this means is that the rest of the team had a derisory Expected Return of -2.60 between them. Excellent free taking from Wexford though if Longford want to progress in the replay they will have to improve on their deadball striking – especially given how few shots they actually take. The above shows how disciplined the defences were by only giving away 8 “scoreable” frees. This is especially so of Longford when you look at the disparity in possessions. One point to note is the disparity in the volume of shooters. 82% of Longford’s shots from play came from their “big three” (Kavanagh, McCormack & P Barden) whilst 40% of Wexford’s shots from play came from Brosnan, Barry & Lyng. To prevail in the replay Longford need Kavanagh to produce another excellent game, step up on their deadball shooting, stay disciplined in defence so that they don’t give Brosnan frees and ensure Wexford’s big three are as anaemic again. Simple! !